A hybrid style skatepark that is build into the south slope of the newly constructed 4th Avenue Park (official park name pending). 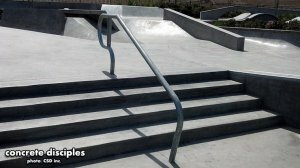 -Rollovers, hips, escalators, trany walls, half pipe, pool coping w/ tile...plenty of flow for the old school and old school at heart. -As with all of my skatepark designs, there are plenty of funky shaped elements that you can get creative with. 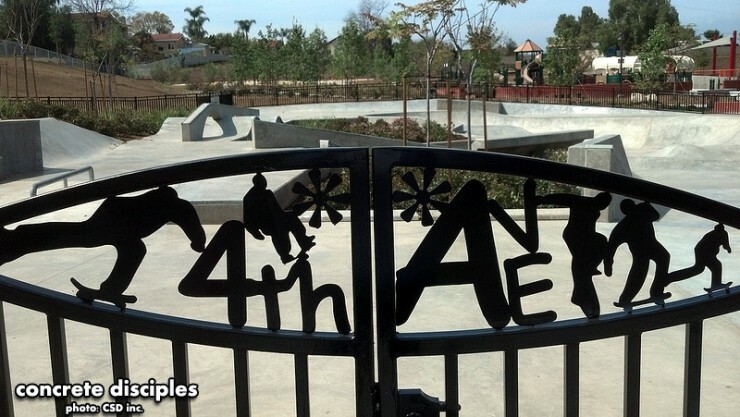 The 4th Avenue Skatepark was designed by Charles H. Strawter Design Inc. as a subconsultant to Katherine Spitz Associates Inc., the prime consultant and landscape architect for the 4th Avenue Park project. The skatepark builder is Geocon Engineering a subcontractor to CS Legacy Construction Inc. The park is being developed by the Community Design Commission of Los Angeles, under the jurisdiction and management of Los Angeles County Department of Parks & Recreation. The grand opening is scheduled for May 2012. Overall a really fun park with a variety of terrain. Its pretty small as far as transition goes, but the street obstacles are are all sizes. The pad police dropped by and made everyone put on their helmets and stuck around more then an hour so the skating was held in check for the most part until they left. It's definitely a fun one.